Yes, it is fall in MN, so what do I expect? The colors are pretty, the days are crisp, and I love wearing jeans and sweatshirts again! I do, however, miss the sunlight. By the time I get home from work the sun is getting lower, and if I run any errands it is definitely dusk (especially today when it has been mostly cloudy all day)! This explains why the pictures I planned to take of my newly started Vintage Velvet scarf are not so good! I had taken pictures of the yarn a couple of weekends ago….so I do have proof that it is sunny here sometimes! 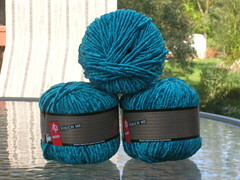 I have 6 skeins of Muench Touch Me yarn in Color 3609 (Turquoise)!! I was so excited when I purchase them…..they are just sooooo soft! 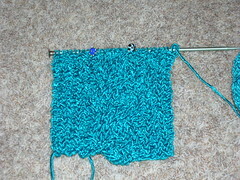 I cast on this past weekend, and worked on it feverishly last night with Trish on our knitting night. I thought I had made good progress…. Do you see it in the upper left?……yes, I know the photo is horrible and no one could see a mistake from actual stitches, but I had to try! 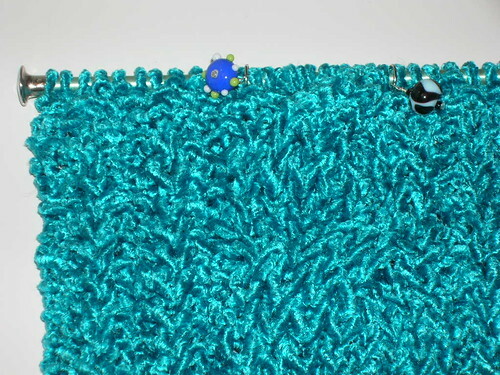 I am hoping that if I do a couple more rows it won’t be a mistake and will just be the stitches pulling “funny”. (This is how I keep myself hopeful.) But while I hope that I really don’t have to take any rows out…please note the very pretty stitch markers my sister made for me (the only reason I left the picture in)! She has been making her own glass beads for over a year now. I have some beautiful earrings from her….and now very cool stitch markers! (Since this scarf is going to be her Christmas present I know she will appreciate that I actually used her markers to make it!) I will try for better pictures later!